I'm pretty sure it's time for most people to go back to school. You know how I know? Hardly any of my friends are available to stuff our faces with Waffle House and there's a noisy school bus that likes to beep its way along my street at 6:45am. 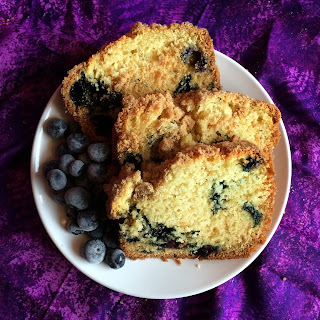 Aside from that I have it pretty good; my classes don't start for another three weeks but I still get to make yummy back to school recipes like blueberry muffin bread, which makes a great breakfast or lunchbox treat. 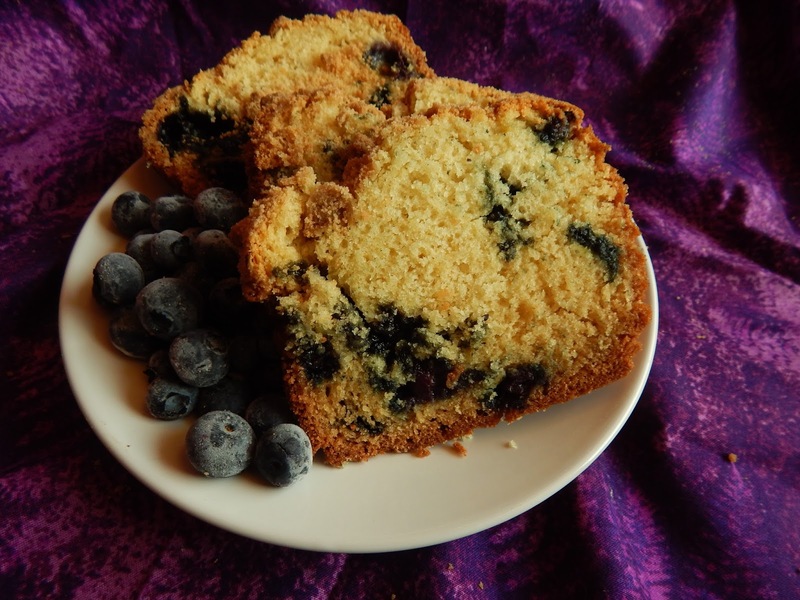 I'm all for the convenience of individual blueberry muffins but sometimes I just want to slice of as big of a piece as I want without knowing just how many servings it is. My family also has a tendency to throw extra muffins in the freezer and forget about them, so having a big loaf sitting out on the counter is more incentive to actually eat it, though it tastes so good it won't be sitting out for long. The main thing I like about this cake is that it's basically an excuse to eat cake for breakfast. Honestly, there's not much in here that makes it breakfast food vs dessert other than the fact that it's packed with berries. There's a stick and a half of butter in this thing, so this may not be the ideal breakfast for those using the start of the school year as a second attempt at New Year's resolutions. However, as I said before, it makes a great lunchbox surprise/after school snack/crying after too much homework pick-me-up. I always start with the streusel. 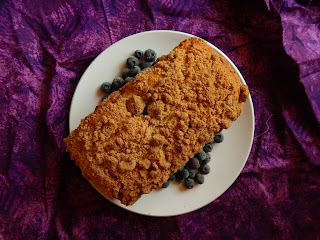 It's a little different than my basic streusel recipe, which you can find tucked into cinnababka streusel buns or sprinkled on top of peach crumb cake. It's a simple combination of butter, sugar, flour, and a pinch of cinnamon. My ratio results in a perfectly crumbly mixture with both big nuggets and crunchy sandy bits. In other recipes I'd add more cinnamon but I went easy on it here since I wanted the blueberries to be the star. You can always bump it up a bit, but with it being peak blueberry season I figured I'd take it down a notch. The actual cake is almost as easy as the streusel. I start by beating butter and sugar together until light and fluffy. I then add an egg and a big splash of vanilla. Like any other cake, I alternate the dry ingredients with the wet ingredients. This is far easier than trying to stir buttermilk into an overly stiff batter and avoids the inevitable lumps when mixing dry ingredients into a too-liquidy mixture. The final step is adding the blueberries. Since it's still summer, I like to use fresh berries, but I throw them in the freezer for at least an hour. This reduces the number of burst berries so you get distinct pockets of blueberries instead of a purple batter. 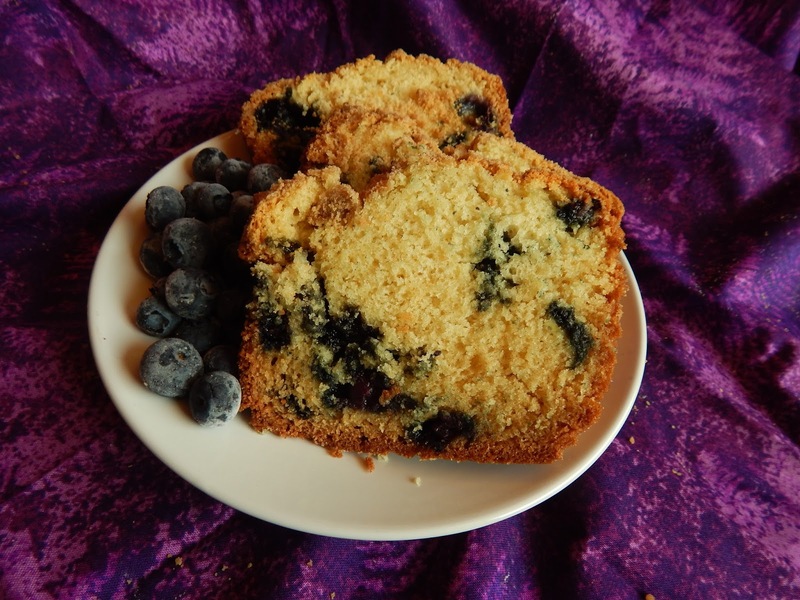 Another trick to keeping the blueberries evenly scattered is to toss them in a spoonful of flour first. This keeps them from sinking to the bottom and gives you gorgeous slices all the way through. When pouring the batter into the pan, you don't necessarily have to pile all the streusel on top. I prefer to do that so it gets nice and crunchy on top. However, you can double it and spread a layer in the middle for a sweet cinnamony surprise. You can also swirl it through the batter for a more interesting visual. All of this is under the assumption you don't eat all the streusel/batter/fresh blueberries before baking since knowing my family that's not entirely out of the question. Heat oven to 350F. Line a loaf pan with foil and grease. Combine 1/3 cup flour, dark brown sugar, a pinch of salt, and 1/4 tsp cinnamon. Add the melted butter and chill. Beat the softened butter and sugar together. Add the egg and vanilla. Whisk the remaining flour, baking powder, baking soda, and remaining salt together. Whisk the buttermilk and sour cream together. Add the flour mixture to the butter in three additions, alternating with the buttermilk mixture in two additions. Gently fold in the blueberries. Pour the batter into the prepared pan and top with the streusel. Bake for 1 hour or until cooked through.